Whether you’re fried on BSG or still hungry for more analysis, here’s a great timeline someone put together. Too bad they misspelled Kobol. It seems to suggest that the Twelve Tribes and the Thirteenth Tribe left Kobol together, built the Temple of Hopes together, and then split, one settling on Earth, the the others founding the Twelve Colonies. This contradicts the Battlestar Wiki timeline (supported by evidence from the show) that the Thirteenth Tribe left Kobol 2000 years before the Twelve Tribes did, and the Thirteenth Tribe built the Temple of Hopes all by themselves. 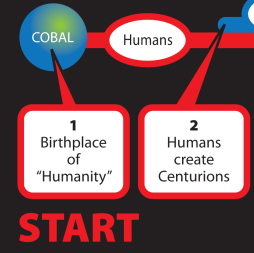 Also, the timeline suggests that it wasn’t until after John Cavil killed Daniel (Number Seven) that the Centurious adopted the notion of the “One True God.” But when complaining about why the Final Five programmed the skinjobs with this idea of God, Ellen says that the Centurions already had an idea of the One True God, which the skinjobs picked up from them (I took this to mean the original Centurions — the “chrome toasters.”) This would support something the hybrid in Razor said: “My children believe I am god.” Monotheistic beliefs were already developing in early Cylons. So, it seems to me, the Centurions had an idea of God long before Daniel even existed. Meaning when John Cavil was complaining (“No Exit”).